Just a 5-minute drive from the centre of Fouquières Les Béthune, this hotel is just off the A26. It is a 20-minute drive from Arras and offers free Wi-Fi access and free private parking for cars, trucks and buses. The rooms at Sunset Price are decorated in warm tones are feature an LCD TV. 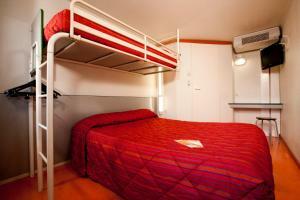 All rooms have a small wardrobe and access to a shared bathroom in the corridor. Every morning, you can enjoy a hot or cold drink, a croissant and a pain au chocolat in the breakfast room. Additional facilities include express check-in if you are arriving outside of reception hours. Located on the main road between Béthune and Bruay, the hotel is also ideally located for visiting Lille, 40 km away. Fouquières Les Béthune Train Station is 5 km away. The hotel is situated near the A26 motorway, a few kilometres away from the city centre and offers a privileged location to discover the area’s tourist and economics wealth. Première Classe Béthune Fouquières Lès Béthunes features 87 air-conditioned rooms that provide a bright environment combining warm wooden furnishings and cloth to modern materials. The hotel also benefits from the comfort and cosy atmosphere of a new generation of hotels. 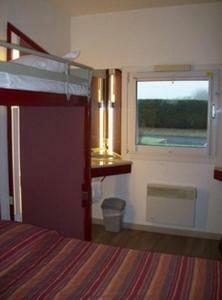 - Take the A1 and A26 motorways towards Calais/Saint-Omer. - Take the exit 6 signposted Béthune. - After the toll, take the second exit on the roundabout. - Take the N41 towards Béthune. - On Béthune’s bypass head towards the A26 motorway.